Since it was established in 1904, the Cape York community of Aurukun has been torn apart by riots and the community school has poorest academic record of any school in Queensland. 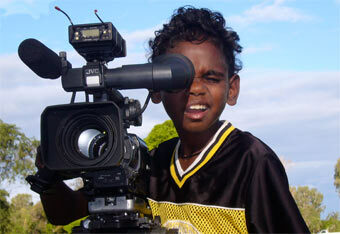 It is one of the toughest Aboriginal communities in Australia to work in. The community school invites David Vadiveloo to bring his Community Prophets programme to help inspire the students. Vadiveloo's model of working with marginalised youth can engage any group of young people in any community in the world. To re-engage students with the school, he works with the students to create three high-quality short films for screening at a national youth festival. The students are pushed to raise their own expectations and to prove to everyone that they can be as dedicated to their education as any young people. In a nation that is abuzz with the proposed 'education revolution', Voices from the Cape is an inspiring story set in the traumatised community of Aurukun and documents a genuinely exciting approach to engaging young people from at-risk communities. Other films by David Vadiveloo: Trespass; Beyond Sorry; Us Mob, a landmark ABC children's television and interactive series; Bush Bikes.